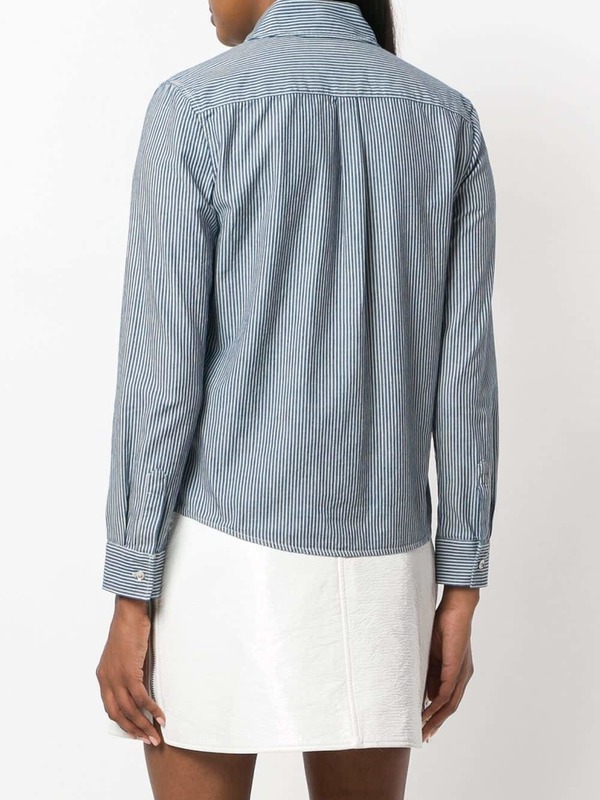 Blue Vertical Striped Dress Shirt by A.P.C. If you're searching for a casual yet stylish ensemble, try teaming an A.P.C. girl striped shirt with white shorts. Both garments are totally comfy and will look fabulous together. If you're on the hunt for a casual yet totally chic look, make a blue vertical striped dress shirt and black leather skinny jeans your outfit choice. Both items are totally comfy and will look fabulous paired together. When it comes to shoes, this ensemble pairs wonderfully with black suede over the knee boots. If you're on the lookout for a casual yet totally chic getup, pair an A.P.C. girl striped shirt from farfetch.com with black leather jeans. Both garments are totally comfy and will look fabulous paired together. This combo of an A.P.C. girl striped shirt from farfetch.com and black jeans is simple, chic and super easy to copy! Dress down this outfit with white high top sneakers. If you're looking for a casual yet stylish outfit, dress in an A.P.C. 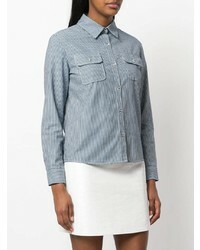 girl striped shirt from farfetch.com and blue jeans. Both items are totally comfy and will look fabulous together. For a smart casual outfit, wear an A.P.C. girl striped shirt from farfetch.com and a pink lace pencil skirt — these two pieces go brilliantly together. Beige leather pumps will become an ideal companion to your style. If you're scouting for a casual yet stylish outfit, try teaming an A.P.C. girl striped shirt from farfetch.com with red floral shorts. Both items are totally comfy and will look fabulous paired together. For something more on the daring side to complete this getup, throw in a pair of white athletic shoes. If you're looking for a casual yet totally stylish outfit, dress in an A.P.C. 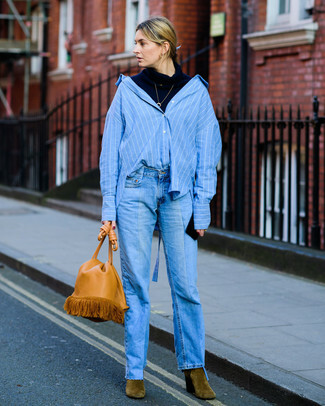 girl striped shirt and blue jeans. Both pieces are totally comfy and will look fabulous together. When it comes to footwear, this look is finished off wonderfully with olive suede ankle boots. If you're on the hunt for a casual yet totally chic outfit, try pairing an A.P.C. girl striped shirt from farfetch.com with navy skinny jeans. Both items are totally comfy and will look fabulous together. When it comes to shoes, this look is finished off wonderfully with brown suede ankle boots.